This pair of models from Ocean Yachts gives you the choice between a convertible or an express—but both boats have a few non-traditional tricks up their sleeves. 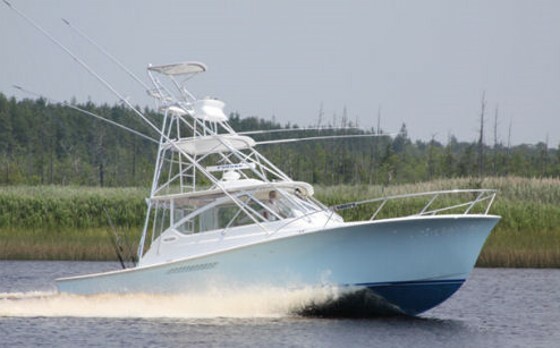 Ocean Yachts is known for building offshore fishing machines, among them boats like the traditionally-designed convertible Ocean Yachts 42 which we reviewed after spending an entire day of shark fishing aboard one. But they changed the game a bit when introducing the Billfisher 37. This model features a flybridge, but instead of finding an enclosed salon below that bridge the Billfisher has an open-air arrangement. That design works well for blood-and-guts guys who are interested in fishing and fishing alone, but many anglers of this same mind-set want an express design. 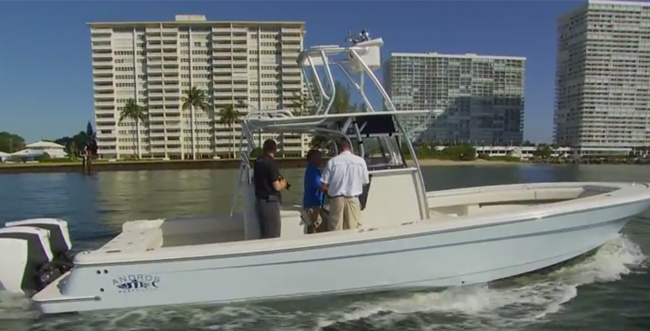 So Ocean took the cue and introduced the 37 Express, which is based on the same hull. And the second incarnation of this boat gives you an express option. 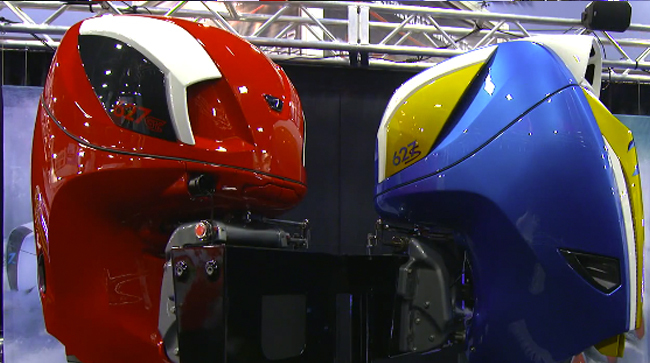 Both of these models can run with relatively small diesels in the engine room, ranging from 480-hp up. 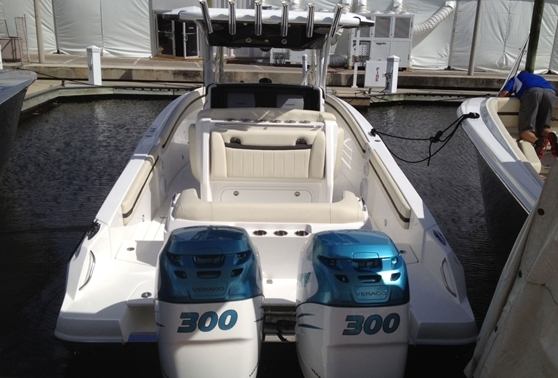 The Billfisher can handle up to 600-hp, and the Express up to 530. Either way, you should be plenty happy. I spent a day trolling for tunas in Washington Canyon on a 37 Express fitted with a pair of 480 Cummins QSBs, and truth be told, they provided plenty of power. 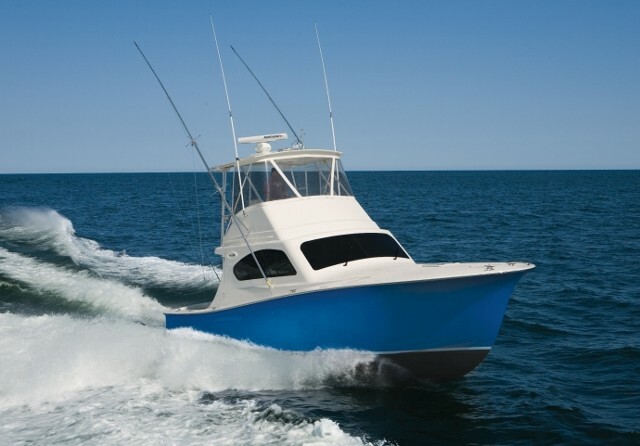 We cruised out to the fishing grounds at around 30-mph, and did so while getting better than a mile to the gallon—not bad at all, for any twin diesel sportfisher in this size range. 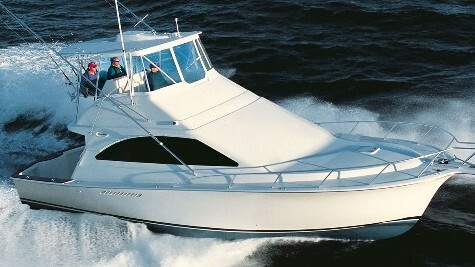 Once we reached the canyons, the boat showed why the express design is favored by many offshore anglers; with the helm so close to the cockpit, Captain Dale Dirks was able to jump from the wheel into the action in one second flat. Perhaps even more importantly, when the sky opened up and a torrential downpour began, the entire crew—seven of us in all—was able to sit on the bridgedeck and keep watching the lines, never more than a few feet away from those rods. 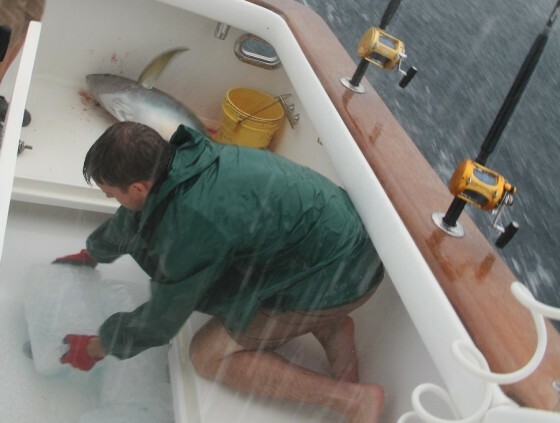 That turned out to be particularly important when the biggest fish of the day, a hefty Yellowfin tuna, decided to strike during the worst of the storm. Dan Dirks preps the fishbox for a chunky yellowfin tuna, caught during the height of the storm. Another surprising thing about these models is something they both share in common: an unexpectedly large cabin. On many express boats in this size range the cabin is really not much more than a V-berth, a basic galley, a head, and a deck just large enough to move between them. 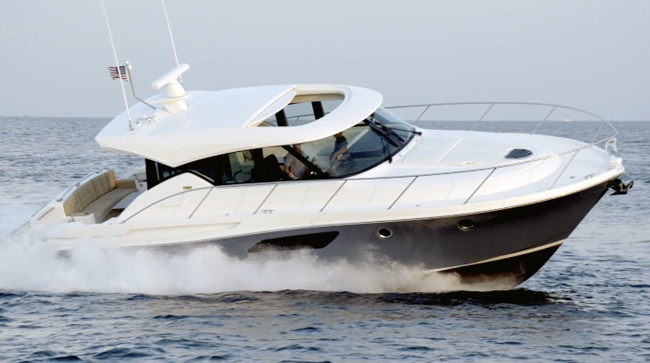 But the 37 has a voluminous bow which carries its beam well forward, allowing for a lot of space down there. In fact, it has all of the aforementioned features plus a settee that’s long enough to stretch out on, plus a pair of hanging lockers. The head has a separate stall shower, and the galley includes a two-burner cook-top, a microwave, sink, and under-counter refrigerator and freezer drawers. I saw room for improvement here; I’d like to see aluminum aircraft-style locking latches, instead of the relatively flimsy ones on the reefer. The downside to a voluminous bow is often a tendency to thump a bit more in heavy seas, but that wasn’t the case on the 37. We came home in a brisk breeze and three foot seas, which the boat squashed underfoot without slamming or banging. In fact, I felt the 37 ran better than some of the larger model Ocean Yachts I’ve tested through the years. 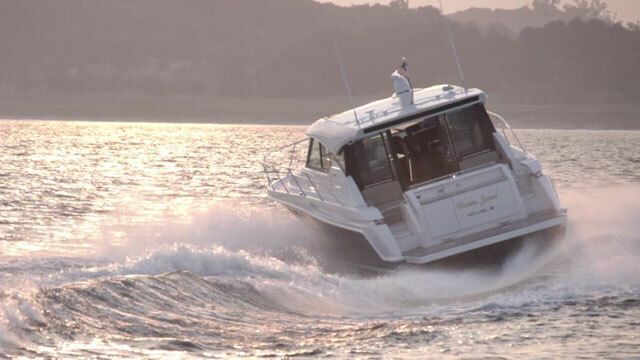 Part of this can be attributed to the 32.5-degree forward deadrise and 12.8-degree transom deadrise, which is fairly aggressive for this type and size of boat. 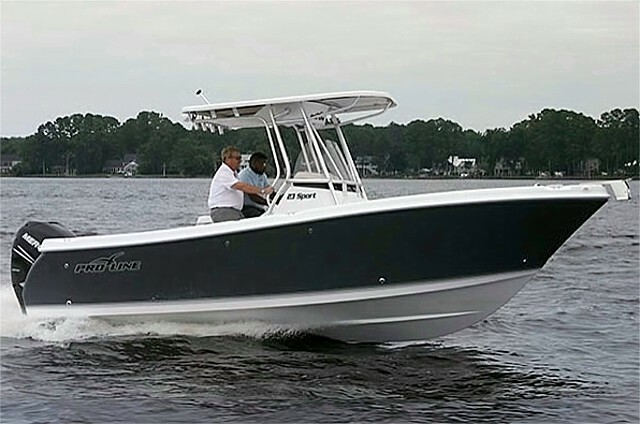 All in all, between the 37 Billfisher and the 37 Express Ocean is giving anglers a big choice in designs, both of which pan out in terms of fishability, speed, and efficiency. And while these aren’t exactly inexpensive fishboats (pricing starts in the neighborhood of $600,000), compared to much of the field they aren’t exactly over-priced, either. That means you can save more of your cash for buying the important stuff—like ballyhoo, fluorocarbon, and maybe a new gaff or two. Not sure whether you’d prefer the Billfisher or the Express model? Check out Convertible vs. Express: Which is Best for Bluewater Fishing to read up on the advantages and disadvantages of each design. 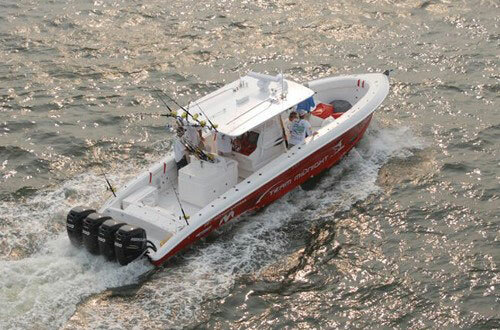 For more information, visit Ocean Yachts.